In the fall of 1897, Dave Rust, a young placer miner from Caineville, Utah, looked up from his sluice box on the Colorado River and gazed at the brilliant sandstone cliffs of Glen Canyon. He wasn’t finding much gold, but he knew that this landscape abounded in scenic beauty and that people would pay good money to see it. A quarter century later, he would fulfill his dream of taking adventurous travelers through this stunning canyon in his little canvas-covered canoes. By that time he had amassed a comprehensive knowledge of the geologic wonders of the Colorado Plateau province of Utah and Arizona, and each summer he led month-long pack trips through a mind-boggling variety of cliffs, mesas, mountaintop overlooks, and hidden desert canyons. David D. Rust (1874–1963) grew up in south-central Utah, and as a young man he worked a variety of jobs. But the canyon country always called to him, and for more than three decades he was the premier backcountry outfitter and guide in southern Utah. He felt that travel was more than a pastime—it was a chance to enrich one’s mind, and he showed the way to achieve a deep understanding of the Colorado Plateau’s fabulous landforms. 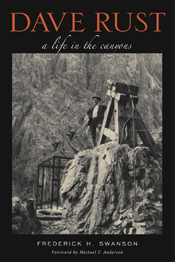 Winner of the Evans Biography Award, the Utah State History Association's Best Utah History Book Award, the Mormon History Association Turner-Bergera Best Biography Award, the Utah State Division of History Francis Armstrong Madsen Best Utah History Book Award, and the Utah Book Award in Nonfiction. Frederick H. Swanson writes and edits publications about the Colorado Plateau’s park lands and wilderness areas from his home in Salt Lake City. "This is a very significant work, for the reason that Rust was a very significant figure in Colorado River and Plateau history, yet nothing has ever appeared in print about him." "Swanson, in his thoroughly researched and intelligently interpreted biography, has effectively established Rust's place in the history of the Colorado Plateau. [He] has placed all students of the Colorado Plateau in his debt with this fine, indeed indispensable, book." "Describes a visionary who ignored the conventional wisdom of the early 1900s and opened a rugged area to tourism." "With Swanson's engaging style, this book will appeal to readers interested in canyon country guiding and river running and in the history of the Colorado Plateau in general." "Swanson provides not only solid scholarship in terms of sources and citations but lively writing as well. His descriptions of the places Rust visited are vivid enough for the reader to picture in his or her mind." "An extremely well-written historical biography that brings to light the life and exploits of David D. Rust."